JUNEAU, Alaska (April 13, 2016) – In response to the popularity it garnered in the Boundary Range Hop Pack, Big Mountain Pale Ale will become Alaskan Brewing Company’s newest year-round offering. The Pale Ale is an expression of bright and bold hop flavors, in a crushable and refreshing beer that is great for all occasions. Simcoe and Mosaic are the featured hops in Big Mountain, and their intensity and complexity are undeniable in this brew. Hints of tropical fruit complement the resinous pine and berry taste and aroma. Day said Pale Ales are an exciting category, because they can bring a great amount of hop flavor and aroma, without the high bitterness levels typical of India Pale Ales. With Big Mountain breaking out of the Boundary Range Hop Pack, it leaves room for a new beer in that package, and Alaskan has filled the bill with Ridge Hop IPA – a single-hop beer featuring the Azacca hop from Australia. Azacca has a citrus and piney character, but also adds a complexity of grassiness. Ridge Hop IPA is now available in the Boundary Range Hop Pack and not available elsewhere. The name and label of Big Mountain pay tribute to the amazing landscape in which Alaskan Brewing makes beer – with massive mountains all around us – and to the adventurers who seek to journey into that landscape to climb, ride and ski the steepest chutes and most radical lines. Alaska is home to North America’s biggest mountain, Denali at over 20,000 ft., and also Mt. St. Elias, Mt. Foraker, Mt. Bona, Mt. Blackburn and Mt. Sanford, all over 16,000 ft. in elevation. Near the brewery, in the outer coast ranges of the Southeast panhandle, Big Mountain climbing and riding is how athletes describe the most extreme terrain. 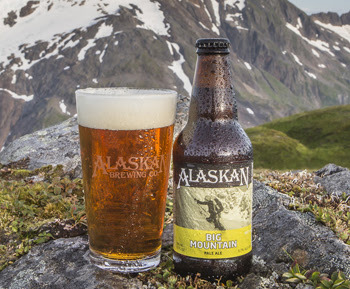 Big Mountain Pale Ale will be available in stores and taps throughout the 18 states where Alaskan Brewing distributes. Big Mountain will be sold in bottles and on draft. For more information, check out Alaskan Brewing’s website at www.alaskanbeer.com.